Sunset on Mount Nebo, Arkansas. December 2, 2008. This is my post for the Scenic Sunday meme, which shares beautiful scenes from around the world. To see more Scenic Sunday posts, or to join and show your own pictures, click HERE. 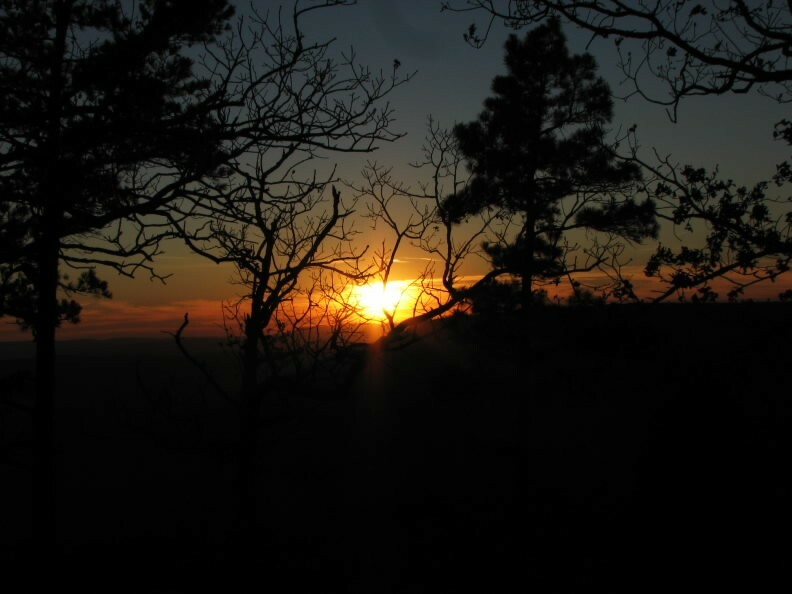 The picture above was taken at Sunset Point in Mount Nebo State Park, Arkansas. Betsy and I are leaving for Mount Nebo early Sunday morning. We have a favorite cabin on the mountain top and we always stay there when we visit the mountain. This will be our sixth visit. Can you tell that we like it there? There are a couple of waterfalls on the mountain and several nice hiking trails, so I don’t think we’ll run out of things to do. If we do decide to get off the mountain there are plenty of other waterfalls and beautiful scenes in the area. I won’t be doing any new posts until we get back home. I will have my iPod Touch with me, and if we can get internet service, I’ll visit as best I can. I’m grateful for the opportunity to return to places that are special to my Beautiful Bride and me. Little River Falls, Fort Payne, Alabama. February 14, 2010. I’ve mentioned, in connection with my new camera, that I’m experimenting with RAW format images. Several people have asked me about RAW, so I thought I would share what little I know about it. Until I got this new camera (a Canon EOS Rebel T1i) my digital cameras saved images as JPEG files (some digital cameras use TIFF format). In order to get the JPEG file the camera converts the light striking the sensor in the camera to something that we can see. JPEG files typically are made up of 8 bits of data per color per pixel. But the sensor can provide 14 or more bits of data per color per pixel. We can see the JPEG image, but the conversion uses only part of the recorded data. I know I’m showing my age, but think of the days when cameras used film. A JPEG file is like a print or a slide — we can see the image. A RAW file contains all the data the camera can provide (those 14 bits per color per pixel) but it is like undeveloped film — we can’t see the image until some processing is done. In working with RAW format I have to do the work that the camera does with JPEG. So what have I learned after a week of experimenting? The most obvious thing is that RAW files are much bigger than JPEG files (about four times bigger in my case). Another thing is that to take full advantage of RAW data, special software is needed (Canon included software with the camera). On the other hand, since all of the sensor data is present, images can be ‘fixed’ in ways that might not be possible otherwise. It is even possible to change some of the picture settings after the picture has been taken (it looks better with landscape settings than with standard settings). Right now I’m not sure how much I will use RAW. I’m cheating right now and am saving images as both RAW and JPEG files. The card in the camera is big enough that I can take several hundred pictures before I have to download to my computer, so I’ll probably continue to do that while I learn more about the things I can do with the RAW format. Fairfield Glade, Tennessee. February 18, 2010. This is my post for Skywatch Friday, a meme for sharing views of the sky from all over the world. To see more, or to join and share your own photos of the sky, click HERE. We had blue skies and sunshine on Thursday — we hardly knew what to do. Even more amazing was the fact that the temperature got above freezing for the first time in about 10 days. 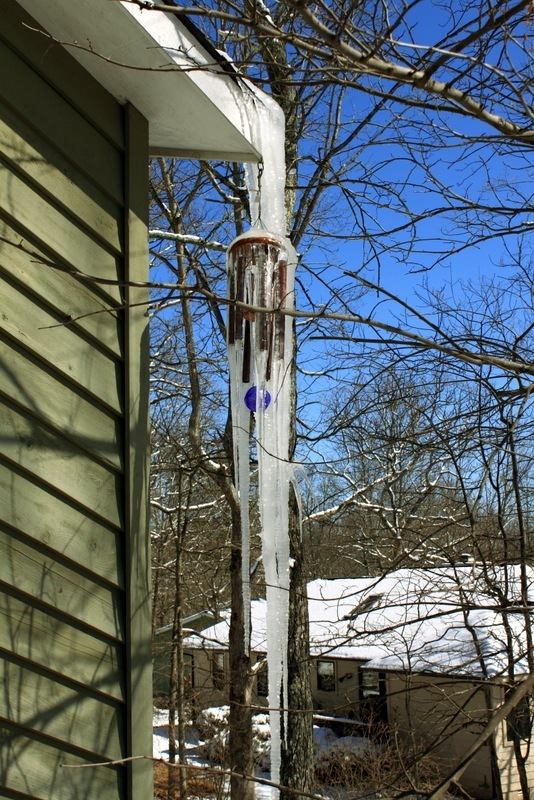 The result of all that warmth and sunshine was this giant icicle engulfing a wind chime on the south-east corner of our house. I don’t know which impressed more — the blue sky or the icicle. By the end of the day the snow on the roof of our neighbor’s house was gone, but much of the icicle was still there. Little River Canyon, Fort Payne, Alabama. February 14, 2010. Little River is one of the country’s longest rivers that forms and flows for most of it’s length along the top of a mountain. The river begins about 1900 feet above sea level on Lookout Mountain and ends at 650 above sea level at Weiss Lake. This results in one of the most extensive canyon and gorge systems in the eastern United States containing one of the South’s clearest, wildest waterways. Canyon Rim Drive follows the western rim of Little River Canyon for the final 11 miles of the river’s length. There are several overlooks along the route which give wonderful views of waterfalls, rapids, canyon walls, trees, plants and birds. At one overlook we even spotted some kayakers down in the canyon below. I think the Little River Canyon would be beautiful any time of the year, but the water flow can be quite low during the summer months. But if you are near Fort Payne, Alabama, I think you would enjoy Canyon Rim Drive any time of the year. Betsy and I took advantage of a break in the weather to go to Hendersonville to check in on my parents. Both of my parents were in good spirits and we were able to help them with a couple of problems they’ve been having around the house. But the most amazing thing for us was that once we got off the Plateau there was no snow to be seen! However we came back home to snowy reality. In fact it is snowing as I write this on Wednesday night (enough already!!!). I’m grateful for all the beauty of this world — in both nature and in people. This is my post for Watery Wednesday. To see more of our beautiful watery world, or to join and post your own pictures to share, click HERE. Betsy and I saw the waterfall pictured above on our Valentine Weekend trip to Fort Payne, Alabama. 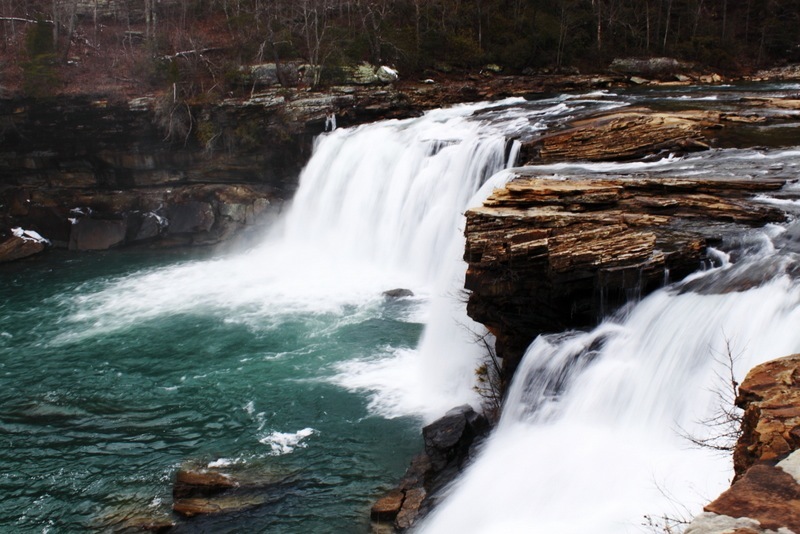 Little River Falls is in the Little River Canyon Natural Preserve near Fort Payne. We enjoyed our visit to Little River Falls for a couple of reasons. One was that although we’ve visited this waterfall a couple of other times, but there was more water going over the falls this time than in the other times we visited. The other reason we enjoyed our visit so much was that this was our first waterfall after we each got our new cameras. Betsy has had her camera for a couple of weeks. I got my camera last week. It’s a Canon EOS Rebel T1i with an EF-S 18-55mm lens and a EF-S 55-250mm lens. As you can imagine, I took quite a few pictures during the weekend. I also experimented with RAW format. This is the first camera I’ve had that supported RAW and I’ve enjoyed seeing what kind of images I could capture. I took the picture above in RAW and then converted it to JPEG for posting. I’m sure I’ll be sharing more of my experiments with you in the days ahead. Betsy under a redbud tree in front of our house, Fairfield Glade. February 15, 2010. This is my post for the My World meme. It is hosted by Klaus, Ivar, Sandy, Wren, and Fishing Guy. To learn more about our world or to join and share your part of the world, click HERE. Betsy and I came back home to Monday afternoon to a very snowy world. Betsy looks very happy in the picture above, but I’m not sure if she’s happy we made it home or if she’s happy because of the snow. 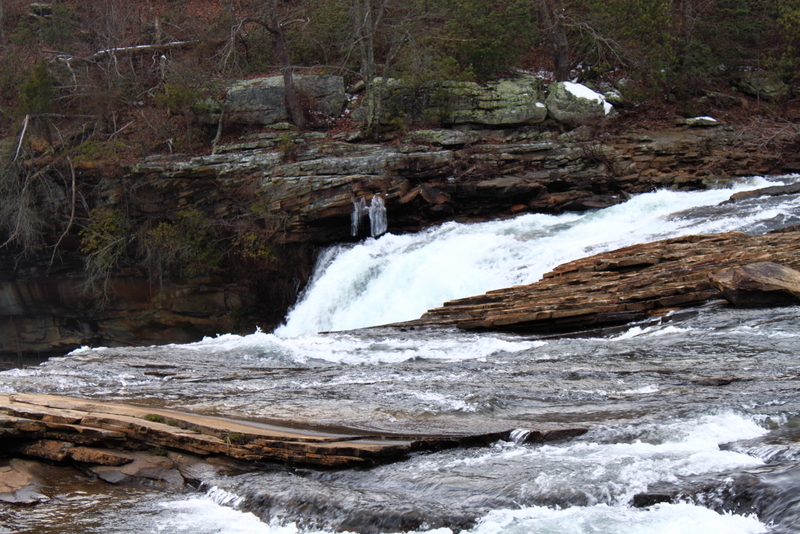 We went down to Fort Payne, Alabama, for a weekend at the DeSoto Falls State Park lodge. Their weekend package included a special Valentine dinner on Sunday and breakfast Monday morning. It was a deal too good to pass up. But, as you might suspect, the big attraction for us was the waterfalls. We’ve been to Fort Payne a couple of times before and really like the area. 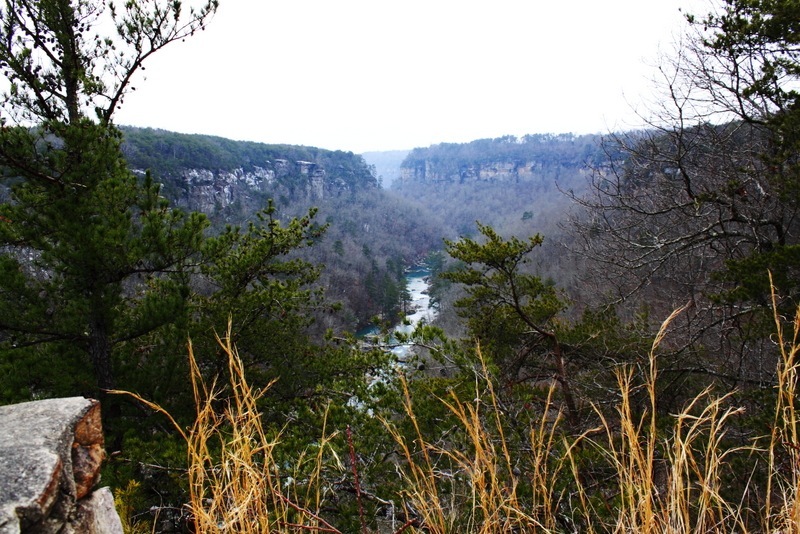 In addition to the park we also visited Little River Canyon, which is sometimes called the “Grand Canyon of the East”. In addition to a waterfall, the canyon also offers some spectacular views from the Canyon Rim Drive. I had this trip planned for a several weeks, but last week they started talking about a major snowstorm over the weekend. Betsy was really torn as to whether or not we should go. She gets a little nervous about traveling in the snow, but felt that if we stayed here it wouldn’t snow and she would miss both the trip and the snow. If we went away she felt the Glade would get the kind of snow she really likes and she would miss it. Betsy was right — we went and the Glade got the kind of snowfall she really likes. But we made it back safe and sound and the snow continued long enough after we got back that she could still enjoy it. I’m almost afraid to ask which she liked most — the trip or the snow! What do you think? Today I’m grateful for safe travel. 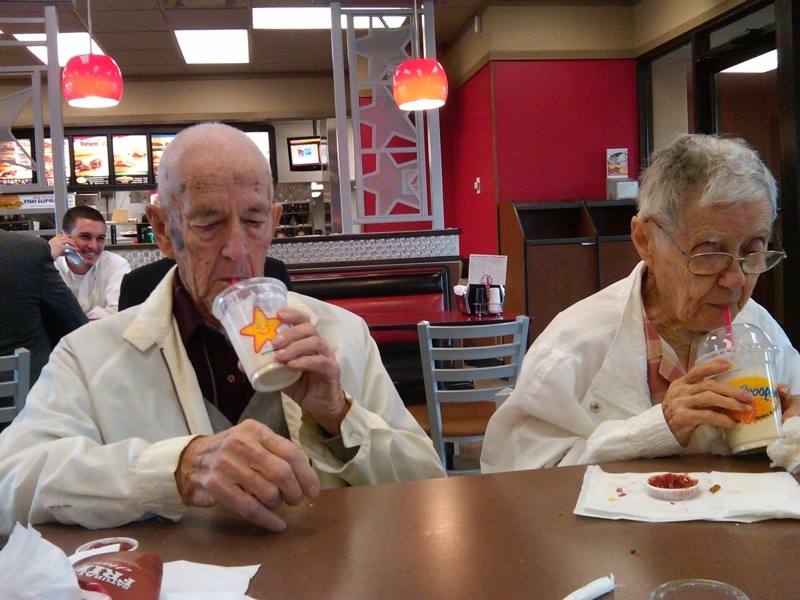 Mom and Dad enjoying a milkshake. February 12, 2010. 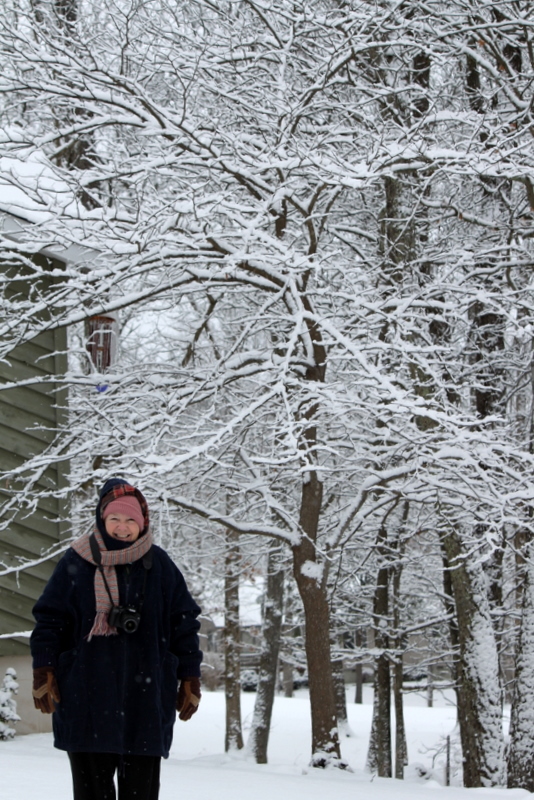 The snow and cold of the past two weeks have pretty much kept my parents holed up in their house in Hendersonville. Friday our friends Judy and Charlie, who live in Hendersonville, took Mom and Dad out for lunch at a fast food restaurant. Mom and Dad enjoyed the hamburger and french fries, but the milk shake was obviously a big hit as well. Charlie took and sent us this picture on his cell phone. We’re supposed to get some snow Friday night and more on Sunday night. I’m hoping to whisk Betsy away for a Mystery Trip between storms to celebrate Valentine Day. I’m also hoping that we can get back home without any problems. I can’t tell you where we are going since Betsy reads this, but the chances that the trip includes waterfalls are pretty good! We hope to be back sometime Monday evening. Today I’m grateful for thoughtful friends who help without being asked. The view from our front yard, Fairfield Glade, Tennessee. January 31, 2010. There was a brightness in the sky behind the clouds and haze that’s been there all month. After doing some research I believe that brightness is something called the ‘sun’. I didn’t have my camera with me to get a picture, but I’ll continue to do research on this phenomenon. I had to go back to the last day of January to get a decent picture for sky watch. This picture was taken after our big snow and ice storm. 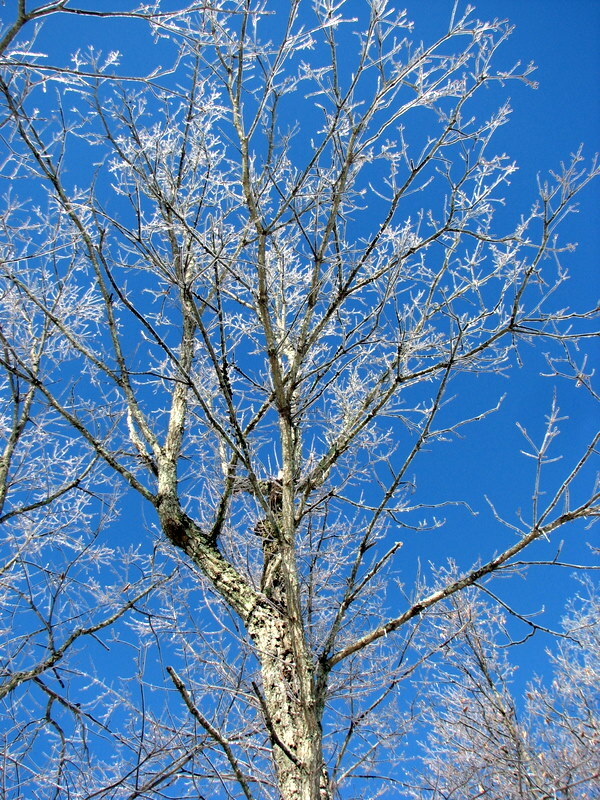 For one day we had gorgeous blue skies, which made a great background for all the icy branches on the trees. Fishing Guy granted me this award the other day. He has a very interesting blog about life in northeastern Ohio and I encourage you to visit him. One of the requirements for the award is that I tell you ten things that I love and which make me happy. 2. All of our children and grandchildren, my parents, brother and sister. 4. Searching for and visiting waterfalls. 5. Music and my iPod. 6. Hiking in the mountains. 7. Reading a good book, especially one about history. 8. Photography — taking and sharing pictures of the things we do. 9. Visiting and being visited by my blogging friends. Janie at Janie & Steve’s Utah Trails gave me the same award for my photo blog, Photos by Senior Hiker. Janie features wonderful pictures of the wide open spaces of Utah in her blog. One thing I do NOT love is having to pick from among the many wonderful bloggers I visit on a regular basis and who visit me in return. So I’m passing this award along to all of you. Feel free to copy the badge and tell us ten things that you love and make you happy. Waterfall on Log Hollow Branch, Brevard, North Carolina. December 12, 2009. 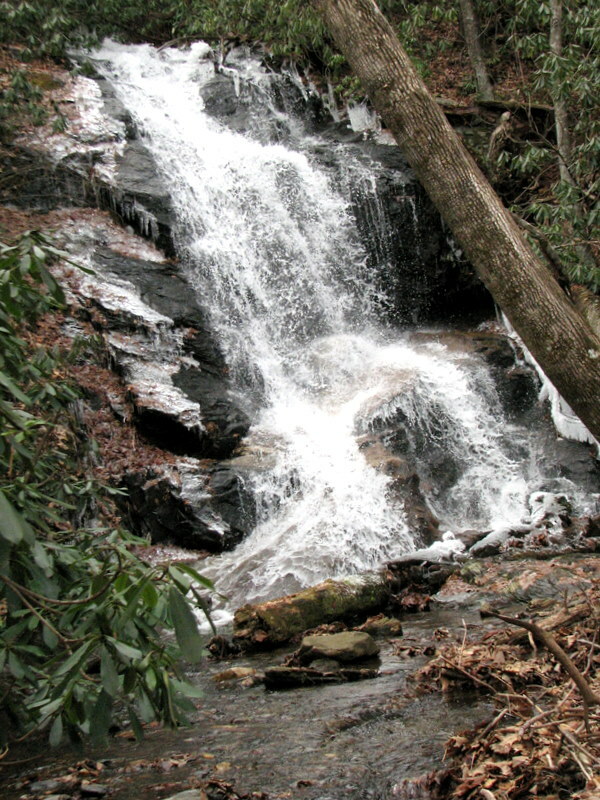 In December, 2009, Betsy and I spent a couple of days in Brevard, North Carolina, visiting waterfalls. Since it was cold while we were there, we didn’t have to worry about crowds on the trails, although we did meet a few other hardy souls. Our longest hike was along Log Hollow Branch north of Brevard near Looking Glass Rock. On our two-mile hike we saw three waterfalls, including the one above. There was a good flow of water over the falls, and if you look closely (the picture can be enlarged by clicking on it), you’ll even see a few icicles. 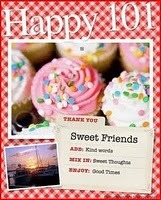 I’m very grateful for all the wonderful people I’ve met in Blogland.